This report recommends that the current cost benefit analysis of assessing health care costs, by Quality of Life Years, used by bodies such as the National Institute for Health and Clinical Excellence (NICE) should be replaced by a more accurate method, known as the Subjective Wellbeing approach. The authors assert that today’s methods for valuing the impact of different health conditions significantly underestimate the impact of mental health conditions on quality of life. They suggest that using an alternative method – the subjective wellbeing approach – provides compelling evidence that mental health is the most important aspect of health for a person’s general welfare. The authors examined data relating to 11 health conditions and found that having either depression or anxiety is around five times worse than the worst physical health condition for people’s subjective wellbeing. The authors also found that depression and anxiety are over ten times worse for people than the average impact of all other physical health conditions looked at in the study. Organisations such as NICE use preference-based methods for estimating the impact of different health states. This asks people to predict how bad having different health conditions would be. But these preference-based methods suffer from a focusing illusion whereby people are likely to focus on the most salient aspects of the condition and this may not reflect how they would experience these states in real life. In the UK, the subjective wellbeing approach has become an established alternative to traditional preference-based valuation methods in cost-benefit analysis. 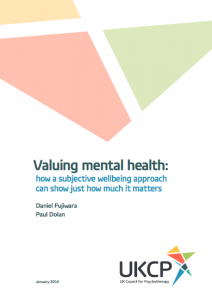 Subjective wellbeing is recognised by HM Treasury as a method to judge the value of policy interventions across all domains and also features in recommendations set out by the Organisation for Economic Co-operation and Development (OECD). This report reveals that good mental health is far more valuable than we once thought. Traditional valuation methods have understated the value of mental health (in relation to physical health) and, as a result, the value and social benefit of mental health interventions too.